Jessica Kates Chadwick dreaded mopping her gym. “Mopping was work. Seriously, it was my active-recovery day and I put it off often because it sucked so bad. Lots of trips to empty and refill the bucket,” said the owner of CrossFit Confederation in Louisiana. All told, it took Chadwick more than an hour to mop her floors. And there was the one time she used a cotton mop on her rubber floors. Then Chadwick discovered microfiber mops. They last longer and are more sanitary, she explained. Still, the microfiber mops weren’t enough to rid Chadwick’s floors of all the dirt, debris and chalk. Keeping floors clean can be the bane of an affiliate owner’s existence. 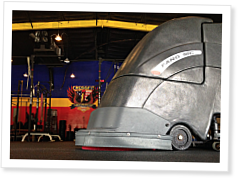 But industrious coaches from California to Australia have found timesaving, stress-less solutions for sparkling gym floors.